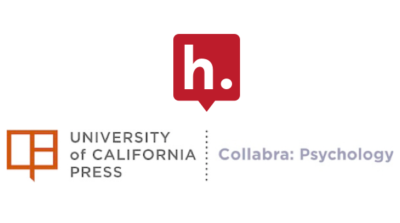 The University of California Press and Hypothesis are pleased to announce their partnership to deploy annotation technology across Collabra: Psychology, the official journal of the Society for the Improvement of Psychological Science, adding a powerful collaboration tool for the community of researchers, authors, and readers in this exciting field. In offering open annotation on Collabra: Psychology, University of California Press is the latest publisher to integrate Hypothesis’ publisher groups, which gives content providers the ability to launch branded and moderated annotation layers across their journals or books. Collabra: Psychology will deploy an open group in which anyone can participate. Authors may use the technology to add additional content or context to their publications and to engage with readers. Journal staff can use annotation to add updates, corrections, or recommendations for readers. Researchers can confirm findings, organize materials for their own research or run journal clubs across journal content and beyond. The University of California Press publishes Collabra: Psychology on the Ubiquity Press platform, which also recently integrated Hypothesis into their platform to enable annotation on books published in EPUB format. Collabra: Psychology, the official journal of the Society for the Improvement of Psychological Science, is a mission-driven Open Access (OA) journal from the University of California Press that shares not only the research it publishes, but also the value created by the psychology community during the peer-review process. Collabra: Psychology has 7 sections representing the broad field of psychology, and a highlighted focus area of “Methodology and Research Practice.” Collabra: Psychology supports the principles of Open Science, including a mandatory open data policy, and an option for authors to choose open peer review. University of California Press is one of the most forward-thinking scholarly publishers in the nation. For more than 120 years, it has championed work that influences public discourse and challenges the status quo in multiple fields of study. At a time of dramatic change for publishing and scholarship, UC Press collaborates with scholars, librarians, authors, and students to stay ahead of today’s knowledge demands and shape the future of publishing.